The Phantom Stranger series from the 1970s holds a special place in my heart. Most of the stories were self-contained tales of mystery/horror/suspense where the Stranger was often a supporting character. The Phantom Stranger #26 was the most unusual issue out of the entire run. The Stranger took a key role in the story and actually crossed-over with the backup series, The Spawn of Frankenstein. 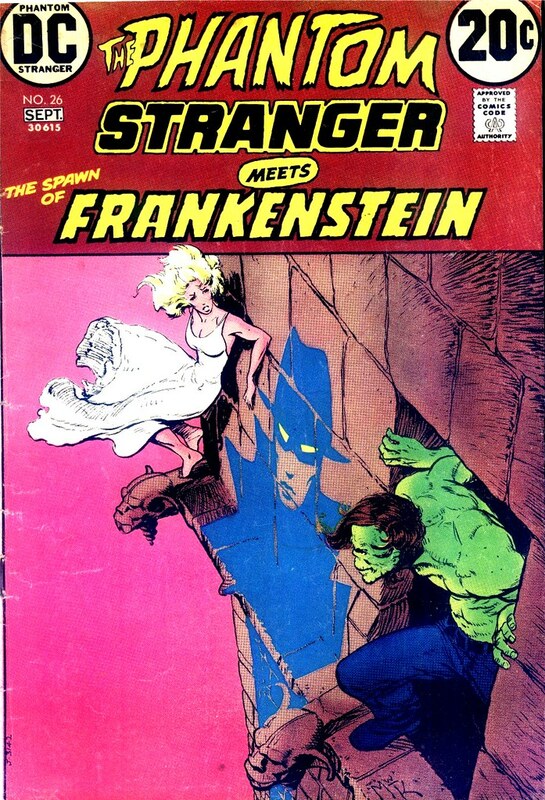 DC Comics' version of Frankenstein isn't as memorable to me as Marvel Comics take on the character. But I have always loved this cover by Michael Kaluta, featuring the Monster chasing a woman on a ledge decorated with gothic creatures. The simplicity, the angle of the shot, and the Stranger's silhouette are perfect. Happy Halloween! Nuff Said! No, we didn't confer, I guess great minds think alike! Thanks dude! Great use of white space in the cover design. I wonder if the colors were by Kaluta or someone else. A pink sky seems weird now.